A quick repair story from a kind contributor (Martin, you can find him at www.mjbrf.com). (1) I have a unit that generally works OK but has stopped displaying spans above 2MHz/div. (2) I still get a display on the higher frequency settings e.g. span/div frequency etc etc are displayed at top. However, no trace is displayed. (3) If I manually sweep using the 100 MHz test signal / comb generator or external frequency source I can still identify the peaks of the signals in the higher span/div settings. Note that there is a “NARROW” signal used in these machines, which will switch state when span is set above 2 MHz/div. 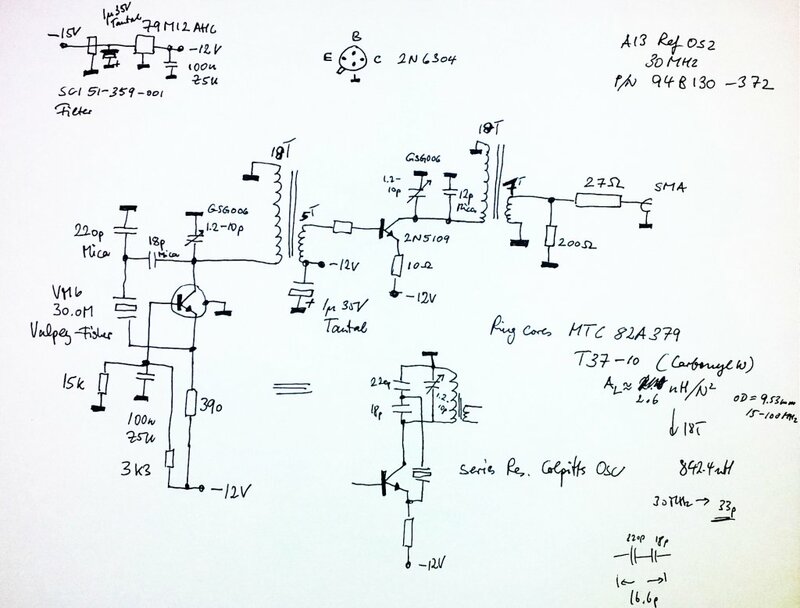 So, best start with looking at all the circuits that are affected by the NARROW signal. The problem was with the A18 (Full multiband assembly board). When I scoped out the “over sweep blanking signal” (TP1) the signal was high as soon as the unit was set to >= 5MHz/div. The signal into the board was OK though. Anyway, I checked U3B opamp and the signal on the output was stuck high on all the higher ranges. * Removing the multiband board allowed viewing of the higher span/div settings, without the full / multi band and over sweep blanking functionality. 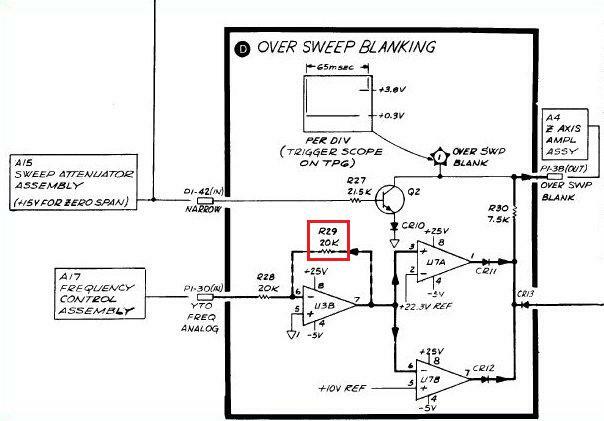 * Isolating the over sweep blanking connector pin from the A18 board to the backplane allowed all ranges to be viewed, but without the over sweep blanking function. Note: The display still looked OK without the over sweep blanking. Anyway, I changed U3 and U7, but still no luck with the operation. 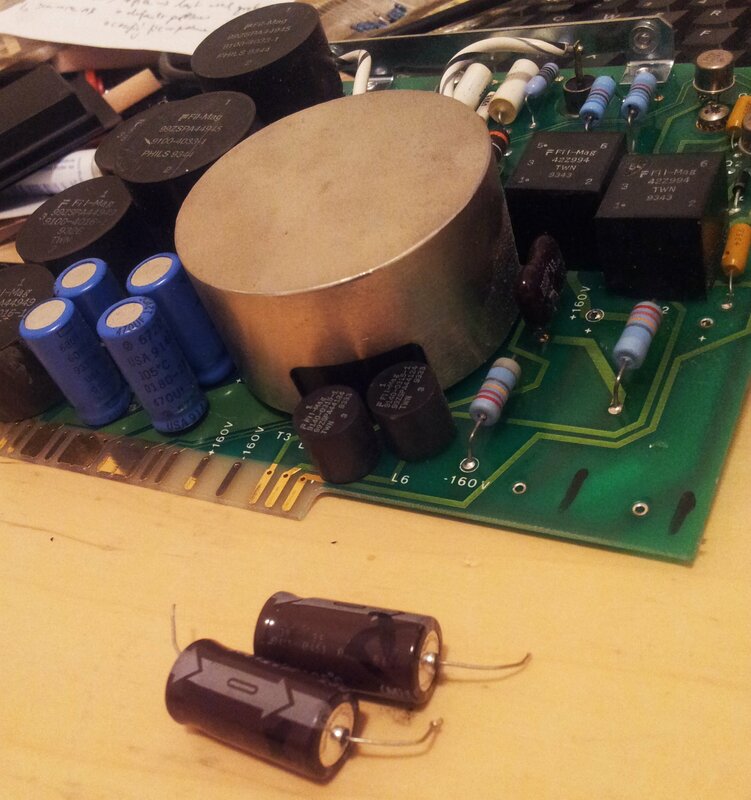 Then I re-checked all diodes and feedback resistors around the opamps. 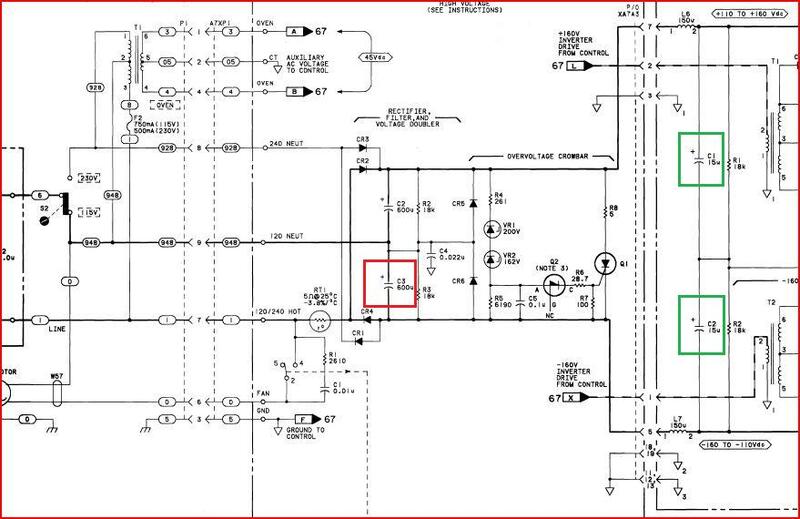 On inspection, I found that the feedback resistor R29 for U3B (see schematic below) had failed open circuit and was effectively putting U3 into an open loop configuration and thus saturating the output. The resistor has been replaced and it all seems OK at the moment. This is a quite uncommon fault, on a low-power resistor – maybe a singular fault, or a lot of defective resistors, who can tell for sure. 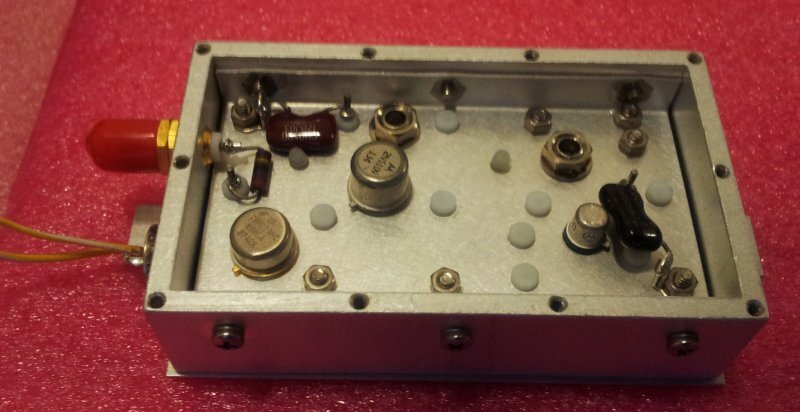 A nice little oscillator assembly came my way, supposed to generate about 17 dBm at 30 MHz. Nothing special at first glance, but after checking out its internals, it appeared to be worth a more careful look. A hand-made box, and even more labor intensive assembly work inside. 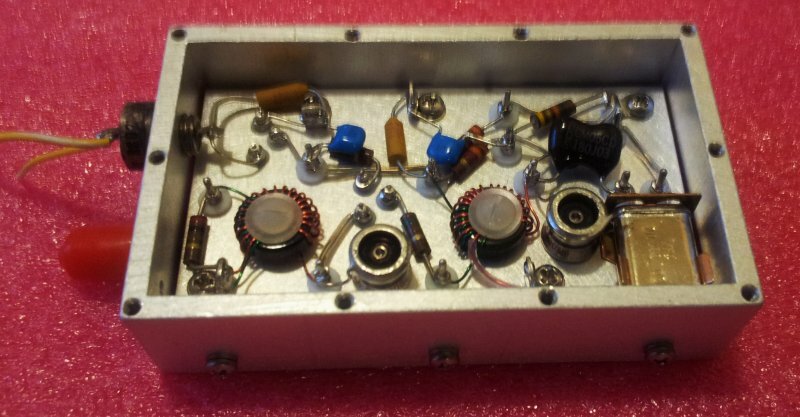 All build by point-to-point wiring, using only the best components available, glass trimmer caps, filters, mica caps – most of these parts are still available today – about 100 USD bom, at least. After a bit of reverse engineering, here the schematic, a modified Colpitts oscillator. 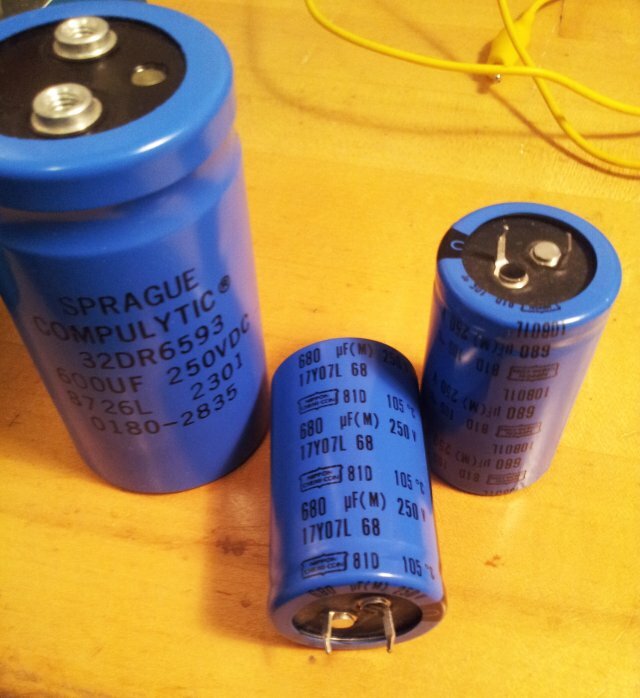 Note: base resistor of 2N5109 is 150 Ohms. To measure phase noise, connected it to my HP 3585A spectrum analyzer (this is really a great piece of equipment, a bit heavy, but still best of class noise performance and holding this title for the last 35 years….). Connected the oscillator via a 6 dB attenuator, to provide a clean load to the output, rather than dealing with the imperfections of cables, adapters, and the analyzer input. Quite shocking, all this noise. The green trace shows the analyzer noise floor. Check, and re-check, still a lot of noise. Too much to be true. 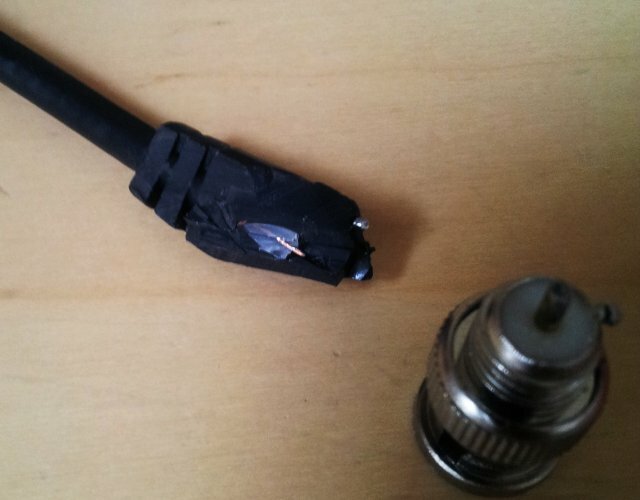 After 3 hours of tests, found the issue: a defective BNC cable. Center connector was fine, but both shields were non-connected. A bit more examination of these cable shows their lousy construction. Not bad for 2 dollars a piece, but you get what you pay for…. 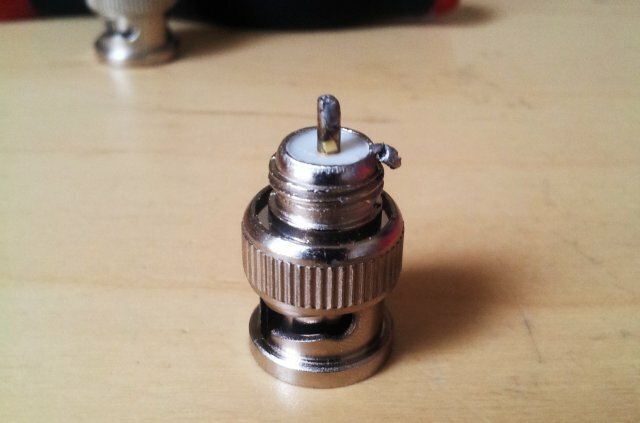 the shield is not even reaching to the plug – there is a 5 mm gap from the screen end, to the actual plug. 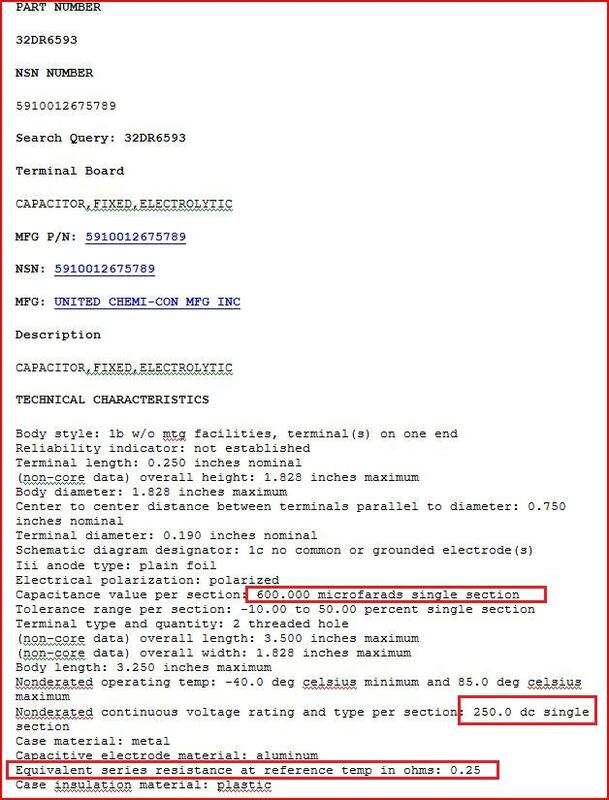 So even if all would have been connected fine, the would still be a lot of leaking, from inside out, and outside in. 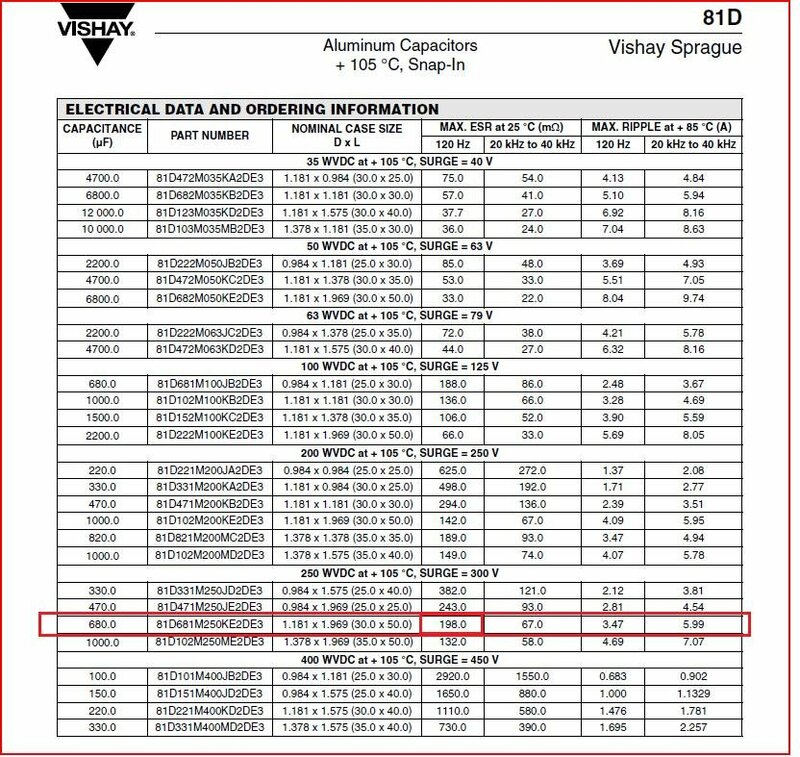 Notice the BNC plugs – these have a somewhat uncommon construction, the dielectric is covered at the front… not quite according to BNC standard. Clearly visible, the cold solder joint…. Turns out, both ends were open-circuit at the shield. 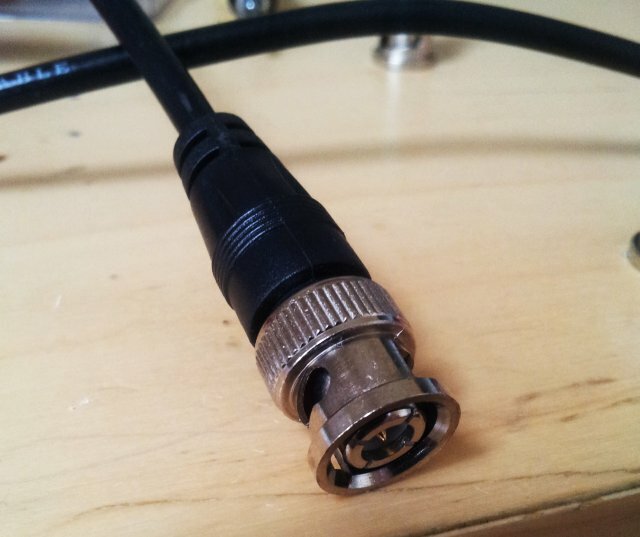 Finally, using a good quality BNC cable (also, using LMR-195 double-screened cable). Looking much better. Noise is down -115 dBc at 10 kHz from carrier. It’s good, but not great. I think one could do better, especially, considering all the pricy parts, and high-quality construction. A good target for a Colpitts osciallator would be better than -130 dBc, at 10 kHz separation. Note the pink trace – this is the bad cable, terminated with a 50 Ohm resistor (with the shield broken at both sides, it is actually a 1 meter wire antenna, with an open-circuit 50 ohm resistor at the end). 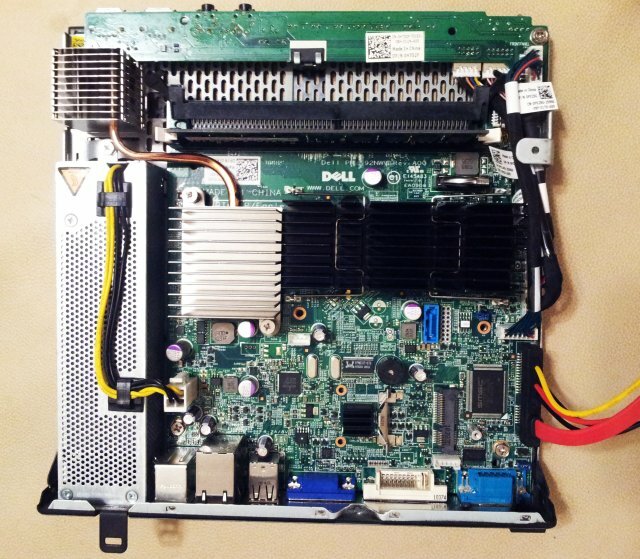 Most of my data, manuals, pictures, web sites, databases etc are hosted on a Dell PowerEdge SC1425 (Dual 2.6 GHz Xeon, 2x 3 TB RAID1), which is a great and affordable machine, but has some shortcomings – massive noise, and considerable power consumption; see earlier post PowerEdge SC1425. Also, it is just one machine, and in case of some severe failure, all data could be lost in case of some unforseeable event like a big thunderstorm hitting the power line… not a frequent issue, but bad enough, if you have to go back to 6-12 months old partial backups. Therefore, I decided to try a different approach – still use the PowerEdge as the main system, but run a more energy efficient and silent machine for the actual business. After review of various options, a Dell Optiplex FX160 appeared to be a good option. This runs on an Intel Atom 230 @1.6 Ghz CPU, and included 2 GB RAM. The price is right, USD 40 for the unit, including a 2 GB SATA flash drive, and completely fan-less, and noise-less. For the storage, 2 GB ain’t enough. First, considering some flash drives, but these still come at a hefty price, for 2 TB storage…. 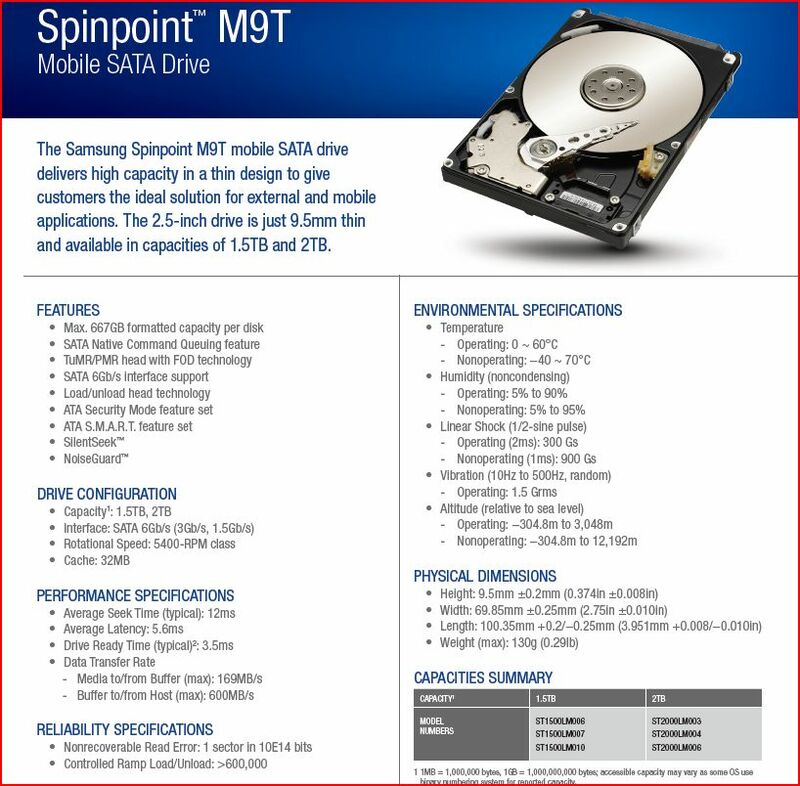 A Samsung/Seagate M9T series will be good enough. These are small, silent, efficient 9.5 mm form factor drives. 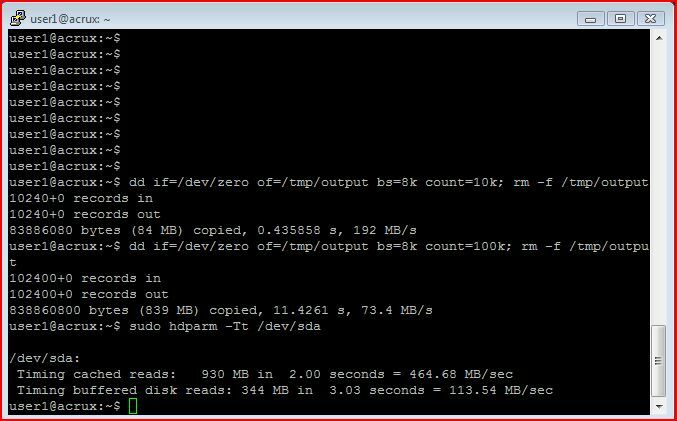 Read/Write speeds are quite OK, >100 MB/s, plenty to saturate my internet connection, and mirroring the main Poweredge server won’t be an issue anyway – this is all done with the system life, and only by incremental update – not so many files will change from update to update. 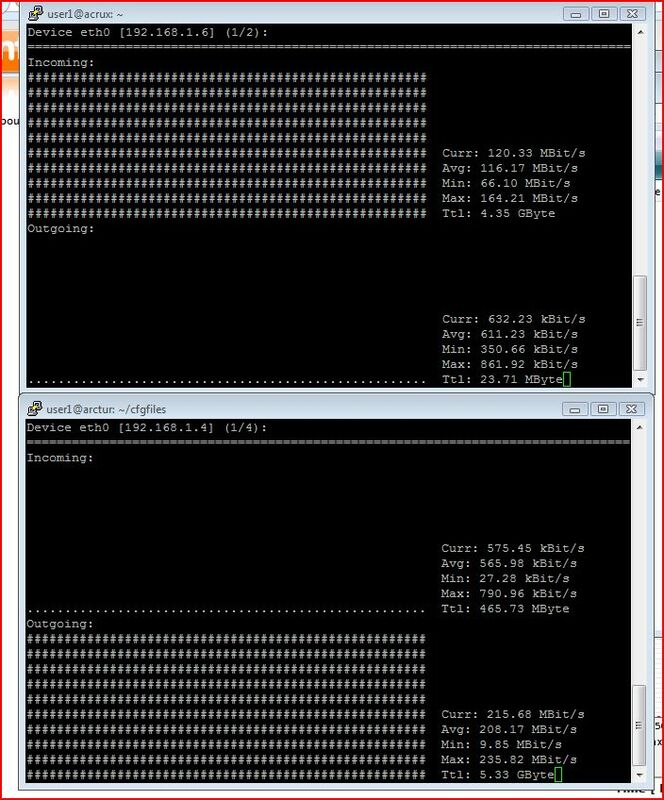 Network performance during mirroring from the PowerEdge Server (aka arctur). Quite a lot of power – in such a nice case; “acrux” refers to a star, and is the host name for this unit. All is run on Ubuntu Server 14.04.3 LTS, including SAMBA (to work as a NAS for various Microsoft Windows based systems, SSH, Apache/2.4.7, and eventually, a printer server).